When you’re looking to elevate the overall look and feel of your indoor space, few home renovations possess as much transformative power as that of new flooring. As a homeowner, it’s in your best interest to choose a flooring option that offers a dazzling appeal and performance that lasts throughout the years. Widely regarded by homeowners and flooring enthusiasts alike as one of the best materials available today, vinyl flooring is sure to serve you faithfully year after year. When it’s time for a change of decorative pace, My Flooring America of Sugar Land is your source for luxury vinyl flooring in Sugar Land, TX. At our expansive showroom, we proudly showcase a vast selection of luxury vinyl tile choices that are equally appealing and practical. Our luxury vinyl flooring comes in a wide variety of colors, patterns, and styles. Not only are they resilient, standing strong in high-traffic areas, but they can also be fabricated to mimic the look of several other desirable flooring materials with uncanny realism. Shoppers will find an impressive selection of luxury vinyl plank flooring for homeowners looking to accent their space with the warming charm of real wood grains. Whatever your preference, you are sure to find a desirable vinyl flooring option that speaks to your vision waiting for you in our showroom. 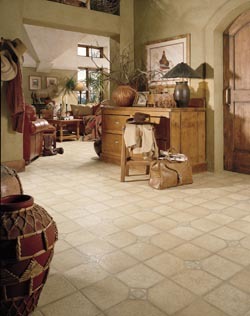 Homeowners covet the beautiful looks of authentic stone tile and wood flooring. However, fitting spaces with these natural aesthetics often comes at a hefty price. When shoppers choose our luxury vinyl flooring, they can enjoy the desirable look of real stone or wood with embossed or textured surfaces in their home for only a portion of cost of the real thing. Best of all, due to the resilient nature of vinyl flooring, areas of the home that normally aren’t well suited for water-sensitive wood floors such as basements or bathrooms can be augmented with its warming appeal. Are you unsure which material would best suit your remodeling needs? Simply share your interior aspirations with our knowledgeable team members and we’ll gladly help you find a selection that exceeds every expectation. Once you’re satisfied with your choice, our skilled luxury vinyl flooring installation team will ensure your new flooring is placed perfectly. Put your installation need in the hands of our capable crew members and we’ll see to it that your flooring solution is every that you expect and more. Rest assured that our professionals will leave you with a new flooring surface that will continue to impress year after year. Contact our specialists to learn more about our extensive selection of luxury vinyl flooring. We proudly serve homeowners in Sugar Land, Missouri City, Stafford, Fort Bend, and Sienna Plantation, Texas.